That's right I finally put my money where my mouth was and made some armor. 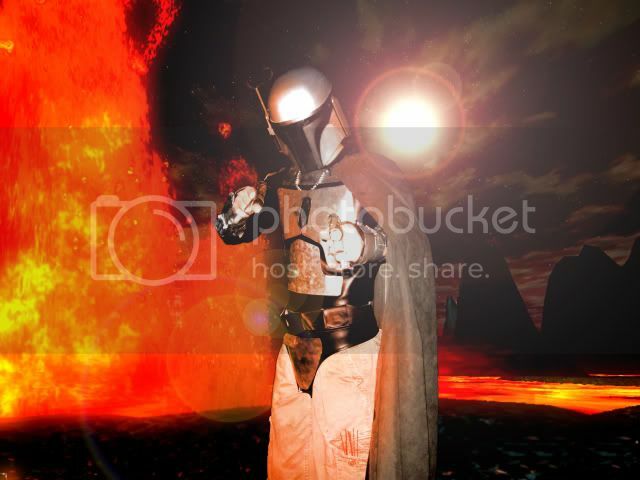 The armor is all real metal (steal), the helm I bought a long time ago (it is the one in my av), and the blasters and duct tape. I will be adding more to it over time but that's it for now. crap, my web filter blocks the image. Whats the color scheme? Nice--metal armor. I'm investing in some too, chestplates and shoulders should be here to morrow. Nevermind, it works now. Looks good, Alo. Freak'n awesome is a better term! Thanks! Oh and it's all home made. WOW! Great job Alo! It looks awesome!! Plan on joining the mercs, Alo? If you do, the visor is fairly transparent, like on my DP--so I'd replace it. Oh, and do you remember what kind of helmet it is? Is it a rubies, or what? Looks good, shape wise. And the plates look really good. I got it from some Halloween store last year for around $80.00 but I can't find the maker. I'm fine with the visor, you can only see through it if I look directly into a light like in the pic. Lookin good Alo! Armor looks really nice man!!! 1. Replace your visor. Having a non-see through visor is a requirement, and they are really easy to replace. You may want to consider a girth belt at some point just to close up the open area at the bottom of your vest. All in all it's a great start man, really impressed with the work on the metal. 1. I don't see the big deal with the visor, as I said it is VERY hard to see through it. But I might change it. 2. I did say it wasn't finished and I am working on some knee pads. Woo. Congrats on some nice Beskgar! Im green indeed. speaking of Beskgar...remember when it used to just be "The armor Boba Fett wore"? Still, looks very good Alo. That's one badasz Mandalorian. I don't know whether to be scared or thrilled. Either way-- great job. I look forward to seeing its completion. Thanks. Here is a pic I made and a comic that shows how fans can feel a lot of the time. Fantastic armour, well done, you have done a funky job. No, its a Penny Arcade. I posted it in Fans a while ago--loved it so much. lol...very true, dude. I'm glad that people filled that particular part of the EU more than anything else--Mandalorians. You've got to love them. 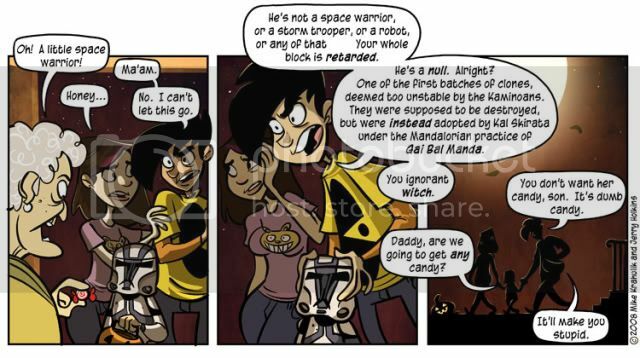 Yep, Penny Arcade. A little crude at times but funny none the less. Plus I am a gamer and get most all their comics. Yeah, I'm glad we have more options now rather then 600 Bobas running around. people could've customized back then...but now we have 600 Jango's, Kal's, Vau's, and everything else running around.